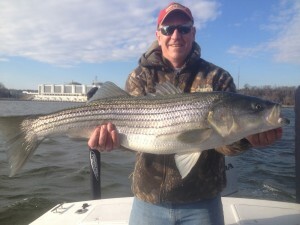 Fishing at Calvert Cliffs has been on fire lately! 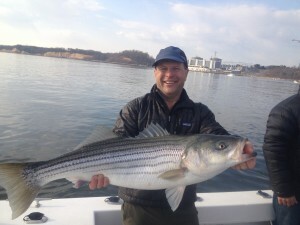 For the last couple of weeks migratory striped bass have taken up residence in the outflow at Calvert Cliffs Nuclear Power Plant. With 2 million gallons of water flowing out of 2 4′ in diameter pipes per minute the water is flowing hard and the fish are in there eating up forage fish like mud shad and river herring. Every day is different…..it can go from great to bad overnight and visa versa….you never know. Lately however, the bite has been great early and pretty consistantly good throughout the day. 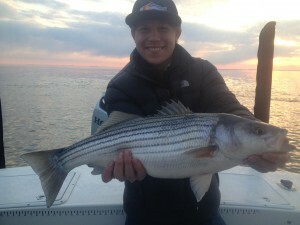 Here’s some shots of some great fish over the last couple of days! 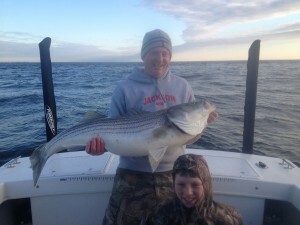 A nice late morning 39″er…..
Charlie and his boy with a 40+ Striper…….WOW! 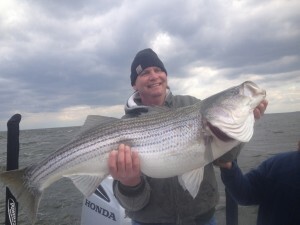 Mammoth early morning whopper…….this lucky guy caught this whopper on his first time dropping a BKD down in Chesapeake Bay for a Striper….holy mackeral! 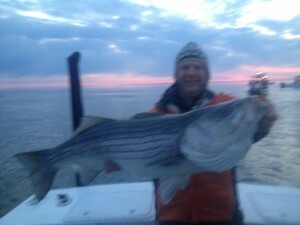 John with a windy day whopper! 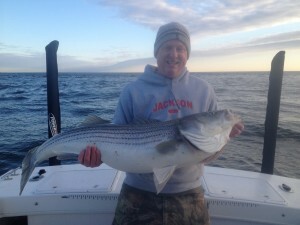 These are just a few of the really big fish caught lately! 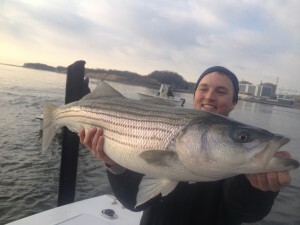 Having a period of fishing never to forget…….even though we’re catching some nice fish in good numbers the overall numbers of Stripers in the bay and in the ocean migratory stock is way down in my opinion. Hoping I’m wrong but I don’t think I am………I’ll never take for granted a bent stick on my boat because you never know when the next one will come…..lately it’s been bent sticks galore! Let’s hope the pace continues……..
my pleasure Rick! Looking forward to our next trip!!! !